Unicorn Homes take pleasure in presenting this lovely, extended semi-detached villa situated in this most sought after East Renfrewshire Council district. Ideally situated for easy access to Glasgow City Centre via nearby M77/ M8 motorway network including access to other major towns and destinations further afield; it is sure to be of interest to discerning buyers. This property offers a great opportunity for families as it is within the catchment area for both St Ninians High School and Woodfarm High School. Primary schools within the catchment area include: Our Lady of the Missions and Thornliebank Primary School. Early viewing is strongly recommended to avoid disappointment. Comprising of well-maintained apartments of entrance porch, reception hall, appealing lounge with dining area, modern fitted kitchen with built in oven, hob and canopy, three bedrooms (bedroom three with en-suite shower-room), quality modern bathroom with shower and conservatory. The property benefits from gas central heating, double glazing, well maintained South-facing gardens to front and rear and paved driveway area. 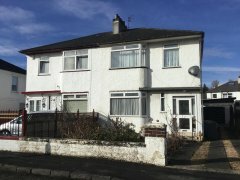 Offers Over £179,000 SOLD 37 Mb/s *est.